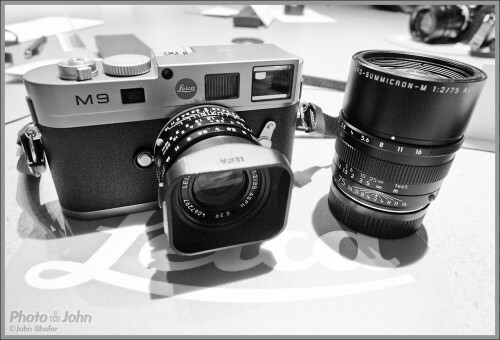 The Leica M9 is a manual focus, 18-megapixel full-frame digital rangefinder camera. Other than the digital sensor, it’s pretty much the exact opposite of what most photographers are using now. That said, the Leica M-rangefinder’s simple, German design and rich history are an aphrodisiac for pretty much every experienced photographer I’ve ever known. I’ve probably lusted after Leica rangefinder cameras since I was in college – about 20 years now. Last week I attended a Leica Akademie workshop at Pictureline in Salt Lake City. I spent the day in a classroom with seven other photographers and a $7000 Leica M9 digital rangefinder. Why Leica & Why Rangefinder? In this era of high-ISO, 10 frames-per-second auto focus cameras with live view, video and superzoom lenses, it might be hard to get your head around the Leica M9. With no auto focus, no scene modes and no high-speed burst, why would someone choose the M9 over a Canon EOS 5D Mark II or Nikon D7000? Two reasons – first, the M9′s simple rangefinder design allows the photographer to relate to their subject differently and thereby take a different kind of picture. And second – the quality. Although Leica rangefinders don’t have all the bells and whistles of a contemporary digital SLR, as soon as you pick one up it’s obvious you’ve got something very different in your hands. The solid, metallic feel is unlike anything else on the market right now. And even though the M9 is smaller than a digital SLR, the metal and glass used gives it more mass than a comparably sized digital SLR. There’s a mystique to Leica rangefinder cameras, lenses and image quality. It’s more than just myth, too. Leica images do have a special feel. Part of it probably has to do with the way the rangefinder makes you approach your subject. But something special happens with a Leica lens open up to f/4 or wider. There’s a bright snappiness to the focused areas and a natural glowing bokeh in the out-of-focus areas that you don’t see in photos taken with other camera systems. This unique image quality is one of the reasons photographers will choose a Leica rangefinder over a more sophisticated digital SLR. From the glass they use to the hand assembly process, Leica lenses are different. They take a lot longer to make and cost a lot more. The difference is pretty clear in the photo below. (Good one, huh?) 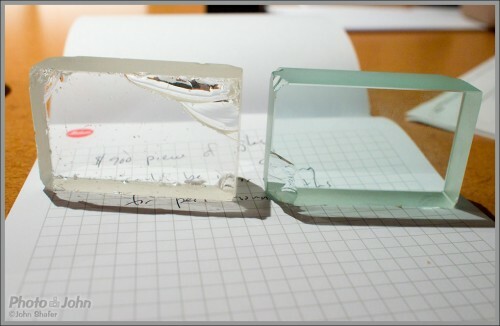 The chunk of glass on the left is made by Leica and costs $900 to make. Leica lenses are all hand assembled in Germany and some elements can spend months in a cooling chamber to ensure they are optically perfect. The chunk on the right is Canikon flourite ED glass – the best Nikon and Canon have to offer. But that piece of glass only costs $19 to make, according to the Leica rep. If you pick them both up the difference is even more obvious – the Leica glass probably weighs twice as much. It’s that special glass that’s responsible for Leica’s legendary image quality. Optics aren’t the only thing that make the M9 different. Unlike a digital SLR, there’s no anti-aliasing filter on the sensor, making M9 images noticeably sharper right out of the camera. And then there are the mechanics of the camera – the rangefinder*, the manual focus prime lenses, and the simplified manual exposure. Using the M9′s rangefinder is a little awkward when you’re used to a through-the-lens SLR viewfinder. You don’t see exactly what’s being captured and you compose with frame lines in the viewfinder that aren’t 100% accurate. On the other hand, there’s no blackout when you take a picture and your lens aperture doesn’t affect depth-of-field in the viewfinder so you see everything normally. Finally, there’s the fact that you have to focus and do almost everything else manually. You are fully responsible for focus and exposure with a Leica rangefinder. The M9 does have a few modern touches – aperture priority and auto ISO help keep things loose and make the transition from a digital SLR a little easier. A lot of photographers yearn for the purity and simplicity of a manual rangefinder like the M9. But the M9′s simplicity is a double-edged sword. Yes – the experience has a simple purity that you don’t get with a digital SLR. But it’s a lot easier to blow it and take crappy pictures. However, if you embrace the responsibility, you will be a better photographer. You have done a good job of selling the M9 to more lust afters and used all the cliches Leica AG love to hear just as much as the till ringing. The fact is it is a huge price to pay and if you were to do a comparison against a range of top DSLRs with equivalent fixed lenses or even fit the superb Zeiss lenses the differences are not noticeable or quantified by the price. Some pros and serious photographers buy Leicas to shoot with but most are bought for collection or male/female jewellery. Am I anti Leica – NO, I have one and love it but focusing with an M was fast and accurate 40 years ago but not in 2011. How much do I use my M – 10% of the time. Are the images better than my FF DSLR, at A2 on a wall no one can tell in the same way no one could tell when I put a film image next to a digitally produced image. Leica Faberge – all that money for a body and you have to pay extra for dioptre correction. I’ve shot with Leica’s and top notch Canon’s and Nikon’s and there’s no comparison, sorry. Leica is a far superior precision product, not a myth but a reality. It all depends what you use it for; DSLR’s are great if you need speed, Leica’s are made for a different type of photographer. Sorry I have to disagree, precision product yes – the myth says… street photography from the the hip, descreet because it is small, easy to focus, great quality, as used by RC,HCB et al. Street- see..http://www.thesartorialist.com/-shoots with a Canon+ zoom and I can give you many more. Discreet/small-yes it is disceeet but looking large thses days. Easy to focus-if you pre focus and set 8 or 11 it is actualy quite hard to focus and its advantage of the past has gone. also why put F.95 on a camera were you do nsee tee the effect until after you take the shot. I wonder what the greats would use today when they were working you had 2 choices- Leica and Contax. I am a Leica user and owner but we have to support the myth otherwise we look pretty dumb spending all that money and using a Rolls Royce to got to the mall or school run. I look forward to the day when Leica moves beyond the simple pair of rectangles in the viewfinder that are only accurate when focused at 1 meter to a system of automatic parallax compensation in viewfinder as lens focused like the Voightlander Bessa III. Disagreements are accepted, that’s the reason why there are different brands for different kind of shooters. If you love to use a Canon for your work then kudos to you, I don’t get into the technical specs, I find it to be a total waste of time; the art comes first in my view, I do a lot of documentary work in third world countries, and to me Leica far exceeds my expectations, taking aside the fact that I can leave behind tons of weight from my Nikon and Canon bodies. I started in film 30 years ago and I produced the same quality imagery as I do now without all the bells & whistles. And at the end of the day… Leica makes my work far more pleasurable, and that’s the bottom line. Thanks for the comments, guys. They add to my article, which is only one guy’s limited experience and opinion. Mjimenezphoto … you are right on in your remarks … I shoot both Nikon and Leica … two different tools for two different jobs. As an avid fly angler, I’d never take my 4 weight, 6 foot Orvis bamboo rod to FL for tarpon fishing. The real issue is, why do camera companies spend millions to convenience buyers you only need one camera. The only Leicas I can afford are 20 years old. We Chinese have a saying – ‘one hundred different types of people feed on one type of rice’! There are so many different types of people in the world. You cannot really find a single product/system that suits everyone; even an iPhone that a lot of people I know disllike using it. I am an engineer and starting from Univiersity, I have a belief as first told by my lecturues/professors that there is no perfect system on earth so that we have to engineer system to suit different application. If there is a perfect system, it will result in only one system in existence. Same as a camera system, if there is a perfect camera system that suits every application and every person, there is only one system left! It would be needless for us to agrue about which system is better! i differ about the Leica vs Everybody else! i prefer a SLR/DSLR viewfinder.Why? The RF vwfndr shows frames that are very inaccurate. More so as the models got newer.. My M6TTL is pathetic.The 50mm frame a joke! The 35mm closer. The 28mm almost perfect. The other great myth! Everything is out of focus except the fine area of focus in a SLR! If you fit a 28mm/35mm lens to a SLR, EVERYTHING appears sharp.Way harder to get exact focus. The area outside the frame in a vwfndr so small, you have no time to adjust if someone walks into frame..OK the SLR may be blind at that moment. I have used the M8 and it was noisy, very poor focus accuracy with longer lens(90mm at full aperture f2). 90mm is a joke compared to SLR lenses.. A 105mm/135mm are jumping off points for longer lenses. Real telephoto like 200,300,500mm. The quality of Leica. Highly exaggerated. All my Leicas are my MOST repaired and serviced cameras. My K-1000 Pentax never serviced! New in 1988. The Spotmatic bought used a few years ago, has also never been serviced! Same age as my M3….The lenses are a bit better. Not a lot, a bit. Full aperture a stop or two over Canon,Nikon and Pentax. Some Minolta lenses were used on Leica R, the Leica SLR system. Renamed the Rokkors. I will not say which. Very pleased with the review. Would i buy a Leica M9 if I won the lottery? Sure! But only after getting a high end DSLR , from N or C.